It's simply magic! Try 4 different exciting Scratch Magic effects. Make cool, colorful and sparkling pictures, greeting cards, "stained glass" suncatchers, glittering paper jewelry and more! 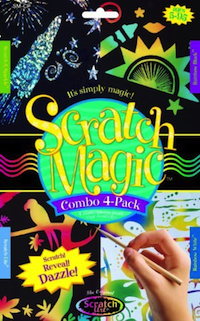 Scratch Magic sets your creativity free! Simply draw your masterpiece by scratching on the black or white coated sheets and watch spectacular colors magically appear! Amaze your friends with the dazzling display! Completely safe and 100% fun! This kit includes 1 sheet each of Rainbow BlackTM Board, Rainbow WhiteTM Multicolor Paper, Scratch & SparkleTM Holographic Board, Scratch-Lite(¨ "Stained Glass" , 1 Wood Drawing Stylus, 1 Stencil with more than 30 amazing shapes and instructions for hours of fun.